A little less than a year ago, S picked up a Dr Suess book and…just read it. Yes, she needed a bit of help, but she read all sixty pages of Hop on Pop like a mofo. Was I relieved? That was the understatement of the century. Sure, all the unschoolers who came before me said to just relax and trust things. But, you know, literacy is a bit more complicated than potty learning. I was relaxed about that, I did no ‘training.’ (Though I had potties everywhere, explained what they were for, and made myself available if needed. Much like books and reading!) At age 2, S decided one day she was through with nappies. Three weeks later, M followed suit. I think each had one accident in the two days following getting rid of nappies, and never again. They were ready. So I clutched our urine free carpet memories to my chest, I held tight to the words of those with older children and teenagers. I read the blogs of adults that had been unschooled. And I held tight. What does unschooling look like when you are learning to read? We’ve never done lessons or anything formal. And that, my friend, takes courage. Did I go nuts and order like four different sets of beginning books? Sure. Did I download Teach Your Monster to Read (WHICH IS AWESOME!)? Of course. But did I ever make the kids do any of those things? No. S learning to read was a quiet event, right before my birthday bonfire. She read a book; we went outside and made s’mores. I wasn’t too surprised as she’d been writing for ages, had begun to sound out searches for youtube videos, etc. But still. Relief. She’s read signs and various things over the past year with this sort of prideful glee, but not cared too much about books. But in the last three weeks? She’s bringing books to read in the car. I’m finding her in various corners of the house, reading. She’s showing me books for older children in bookstores and double checking she’s reading the sentences right. BOOM. So we were 50% there. I relaxed quite a bit – now I had proof I could see and touch, it was easier to believe. But M is very different to S. He doesn’t do a lot of fine motor things, he doesn’t care about writing things down, he rarely draws. We recently read The Neverending Story to the kids and it totally captured his imagination. He’s always liked advanced books; his bedtime book for a good few weeks was a history of WWII book written for adults. So how was he to ever match his intellectual brightness with the stupidity of most beginning reading schemes? I kind of thought he’d be one of those unschooling kids who doesn’t read until ten, but then is suddenly reading Ulysses in a single gulp. Then I heard about another set of books recommended by another home edder. And because I hoard books and love getting stuff in the mail, I ordered them. He picked up the first one AND HE JUST READ IT. 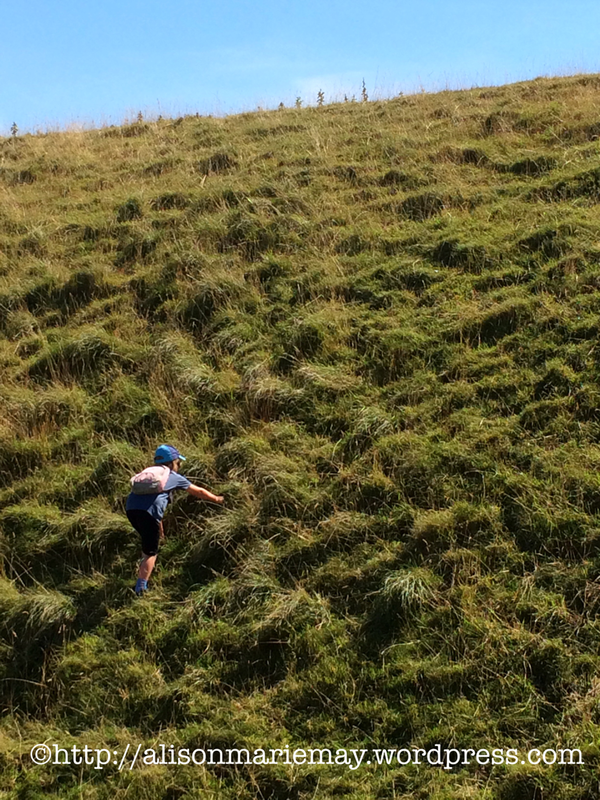 No stumbling, no hesitation. Then he read the next one. Today in the car, S offered him one of her books. And he read that puppy, too! MY GOD I CAN FINALLY EXHALE. Thank you, gods and goddesses of literacy, thank you books illustrated with stick figures sitting on each other while a freaky deaky sun looks on in horror. It’s easy to retrospectively trust in the process, now that we are there. But getting there? I’m here to say it’s okay to worry, it’s normal to doubt – but my god, is it worth it to hang on. Because it’ll happen. And when it does, it’s truly at the right time for your child. They can do it. 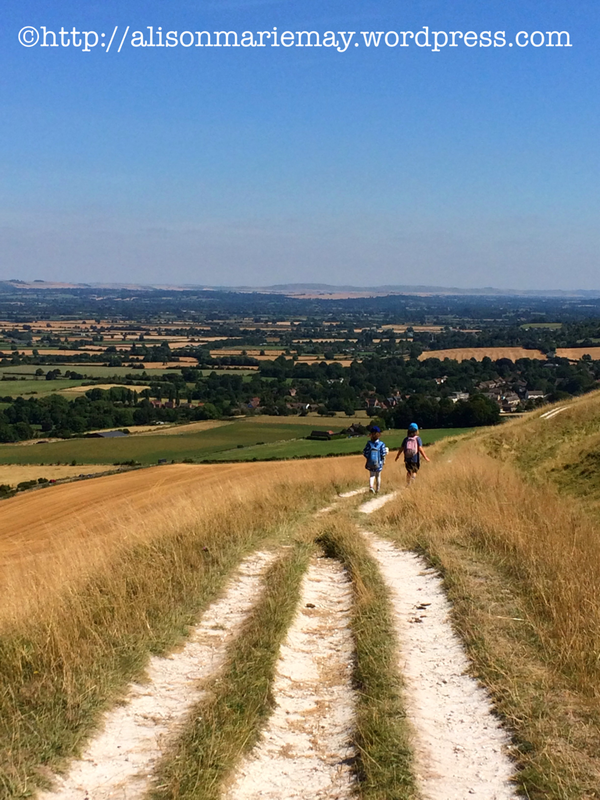 Now I’m off – probably to worry about when they’ll start reading more and more and more…at higher levels…with greater ease…It’s not easy to step of the merry go round of parental worry and guilt, but each little joy and success makes it easier. “Where the smurf are we?” Grouchy asked. 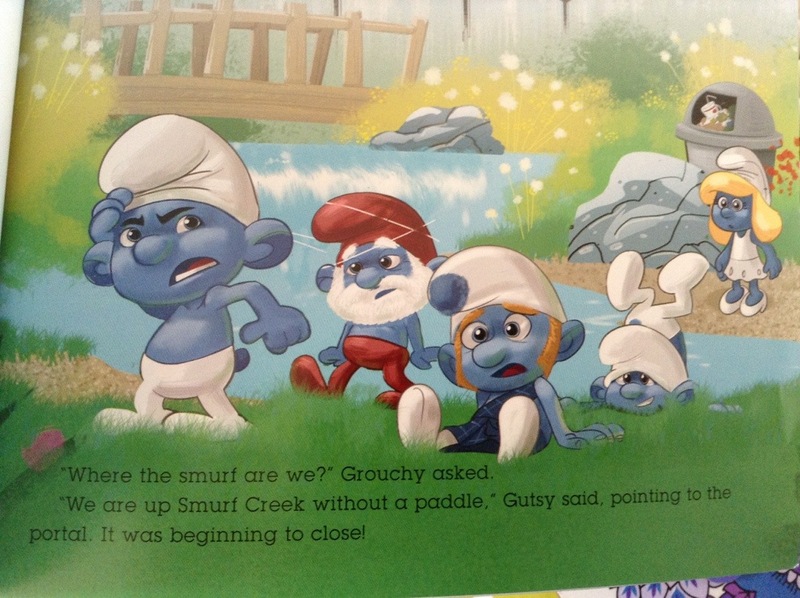 “We are up Smurf Creek without a paddle,” Gutsy said, pointing to the portal. It was beginning to close! The book A Smurfin’ Big Adventure is simultaneously the worst thing I’ve ever read, yet the most intriguing. The dubious plot is spiced up by random nonsensical things being thrown in – portals, human beings (! ), and endless TTDMS (things that don’t make sense). It’s well known amongst close friends that I like bad things. Things that are so bad they circle around to being good again. The movie Sleepaway Camp springs to mind. To be honest, it makes me want to inject a little blue flavoured obscenity into my own life, though my wife has made it clear she doesn’t approve of my new ambition. 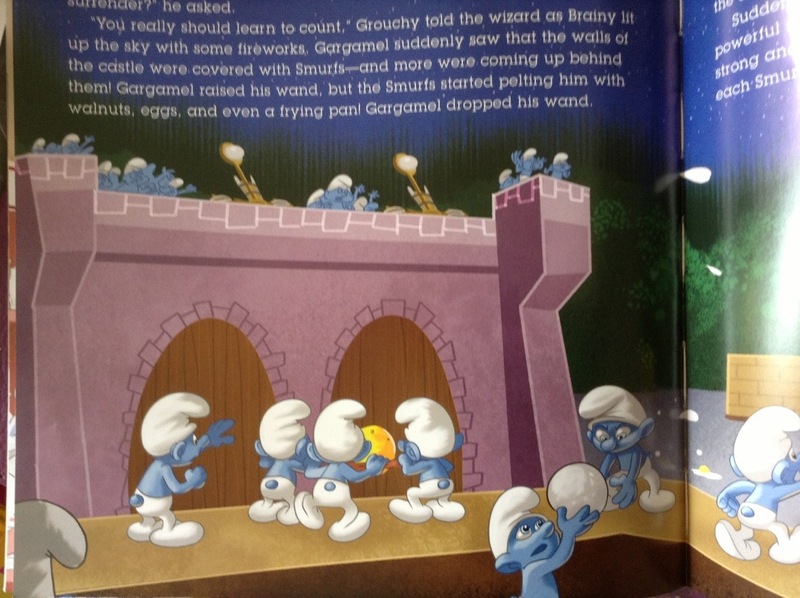 Gargamel suddenly saw that the walls of the castle were covered with Smurfs- and more were coming up behind them! Gargamel raised his wand, but the Smurfs started pelting him with with walnuts, eggs, and even a frying pan! Gargamel dropped his wand. I’ll bet he did. It’s obvious that the poor guy suffers from food allergies and the Smurfs will stop at nothing to defeat him, even anaphylaxis. I hope he has an epipen hidden in his smurfing wand.